Technically speaking, goldfish don't actually mate. Instead, goldfish spawn, which is a process that begins with the males chasing the females around in a madcap fashion, often causing mild injuries to the fish, and ends with the female releasing her eggs into the water and the male releasing sperm to fertilize the eggs. The spawning process can be as short as a few days, a week or more, and can happen more than once a season. 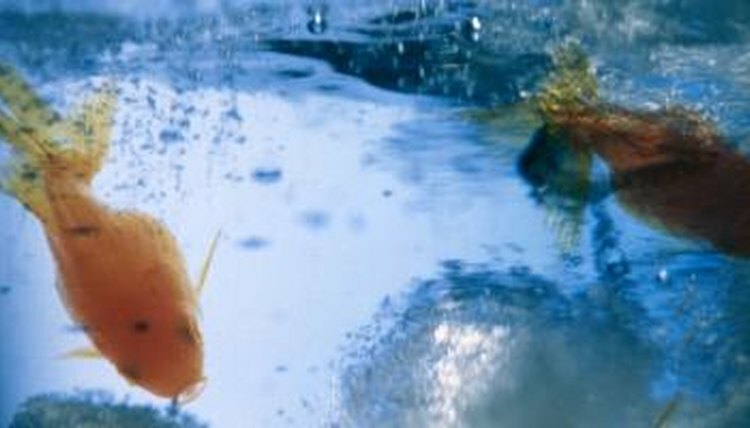 Goldfish get interested in spawning when cold water begins to warm up a little. Gradually increasing the temperature of the water from the 50 degree range up to around 68 degrees Fahrenheit ensures good spawning. The male grows breeding tubercles on his gills and fins and begins chasing the female around the aquarium or pond. He rubs up against her to get her to release her eggs and he persists until the eggs are laid. Late May through early June is when the first spawn of the summer usually takes place, and the spawning activities occur daily until all the females have laid eggs. Goldfish fry can be seen throughout the summer and even into the early fall if the weather has been particularly hot during that time. Sometimes a spawn can go on for a week or more and can put a great deal of stress on the female fish. The goldfish spend several days or even a week or more engaging in the chase before the actual spawn occurs. The fish spend hours each morning racing around the pond or aquarium, knocking each other around recklessly and dislodging plants, splashing water and basically acting crazy. The chase is performed before the heat of the day gets too intense, around 1 to 2 p.m. After that time each day, the fish return to normal behavior. Sometimes if the water temperature stays warm long enough, the fish will spawn more than once. In warmer climates outdoor goldfish might spawn two or three times a season. In aquariums, if the water temperature remains pretty much the same, they may spawn all year long. Many of these baby fish get eaten by the adults, but when thousands of eggs are laid at each spawn, the goldfish population rises regardless of how many get eaten. Goldfish Care – Your Ultimate Guide to Fish Care: How Often Do Goldfish Lay Eggs, Breed or Spawn?